The mission of the Department of Emergency Medicine EMS Fellowship is to develop highly motivated emergency medicine physicians into educators and leaders in the field of pre-hospital medicine and medical direction. The program allows fellows to train with core faculty who are nationally recognized leaders in EMS and have years of experience in medical direction of both ground and air medical programs. The EMS fellow will be an integral component in the pre-hospital setting from both a ground and air standpoint. 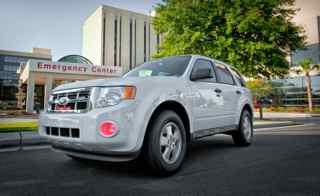 PALMETTO HEALTH RICHLAND MEDICAL CENTER: Level-1 Trauma center serving 16 Counties in the midlands of South Carolina. Annual census of over 87,000 patients with over 25,000 pediatric patients and over 2100 major trauma patients, one-third of which are from penetrating injuries. 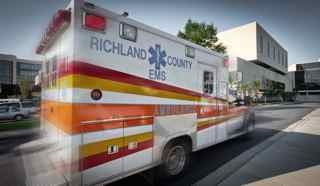 RICHLAND COUNTY EMS: 30 EMS Ground units transporting over 60,000 patients each year to one of four hospitals in the Columbia metropolitan area and numerous rural locations. Two motorocycles and eight Supervisor "Quick Reponse Vehicles"
Rescue boat to facilitate water rescues on Lake Murray, a 75 square mile body of water a few miles from Columbia with over 600 miles of shoreline. 4-wheel ATV to assist with remote wilderness rescue. LIFENET AEROMEDICAL EMS: Four rotary wing aircraft serving South Carolina. Independent command center responsible for communication and logistics of EMS, Fire, and Police within the metropolitan area. Use of a personal EMS Quick Response Vehicle fully equipped with cardiac monitor, airway equipment, and supplies needed to respond to any emergency. Wilderness Medicine rotation (Spring of each year). Opportunity to train and instruct in unique wilderness scenarios. Opportunities for travel with national and international leaders in pre-hospital medicine. The fellowship will be twelve months in length. The start date is negotiable, but will typically begin on or about 1 July of each year. All applicants must have graduated from an ACGME accredited emergency medicine residency and be board- certified or board-eligible with the American Board of Emergency Medicine or the American Osteopathic Board of Emergency Medicine. In addition, the applicant must qualify for South Carolina Medical Licensure. Applicants must complete an application and submit three letters of recommendation for training. One of these letters must be from the applicant’s residency program director. Applicants are not required to have prior experience with EMS, but previous experience will be considered in the selection process. Fellowship applications will be accepted after September 1 of the year preceding the year of training. An interview is required prior to selection for training. Selection for training is determined by the emergency department faculty. Upon completion of training the fellow will receive a certificate of fellowship training from Palmetto Health Richland and the University of South Carolina. Dr. Gerard has been the director for Richland County EMS since 1995 and is also the southeast regional director for LifeNet Aeromedical EMS which serves Palmetto Health. Dr. Shelton is the medical director for Emergency Disaster & Management for Palmetto Health and the Tactical Medical Officer for the Special Response Team of the Richland County Sheriff's office. 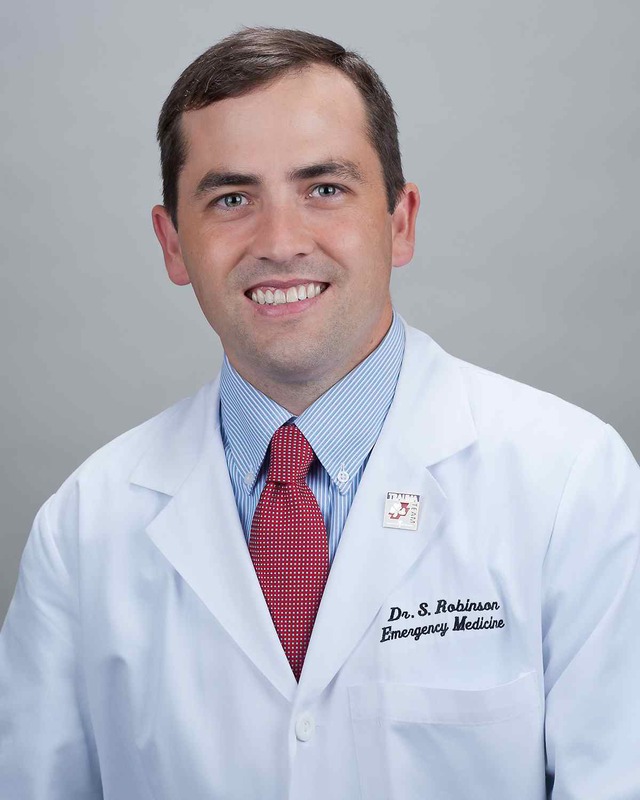 Dr. Robinson joined the faculty after graduating from the EMS fellowship at Palmetto Health. He is the medical director for Kershaw County EMS and Air Care Aeromedical EMS. He is also the associate medical director for Richland County EMS. Dr. Robinson is the associate program director for the EMS Fellowship Program. He lives with his family in Columbia. 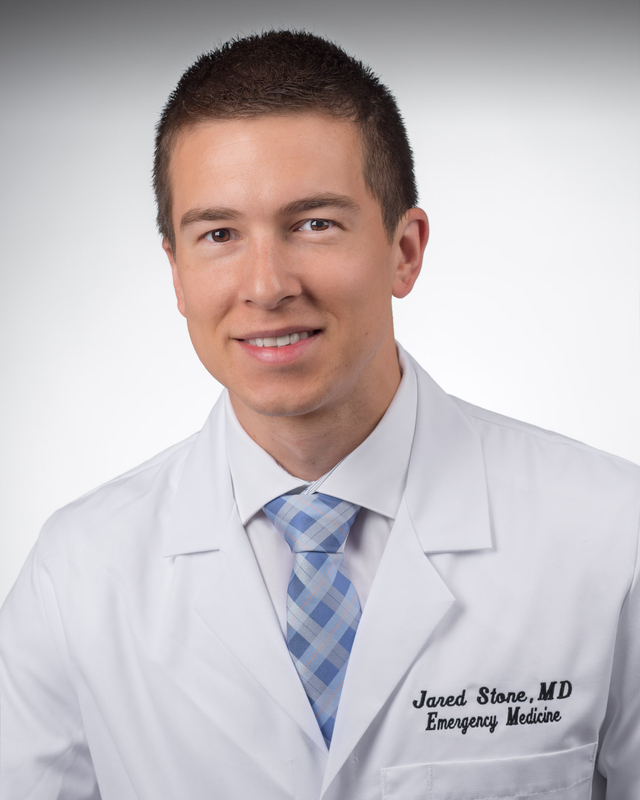 Dr. Stone received his undergraduate degree from teh University of South Carolina and return to Columbia for residency training. He has been interested in EMS since high school and extensively participated in EMS education prior to entering the fellowship. 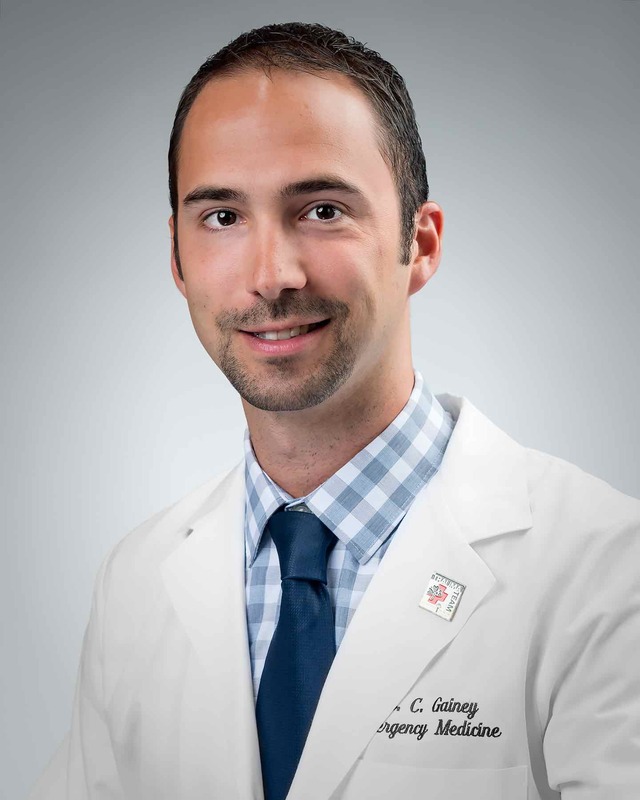 Dr. Gainey is a native South Carolinian born in Florence, SC. He received both his undergraduate and medical degrees from the University of South Carolina. He is the director for the Simulation Medicine Center at Palmetto Health. Fellows work in the emergency department in the role of an attending physician. Clinical work load is 64 hours per month (approximately eight shifts per month). Medical Direction of Multiple EMS Agencies including Urban 911 Service. Medical Direction for Columbia/Richland Fire Department first responder program which encompasses 32 Fire Stations throughout Richland County. Air Medical Program with rotor wing aircraft. Provide medical direction to multiple rotor wing aircraft, attend monthly safety and operational command meetings, and fly as an additional crew member. Tactical EMS with State Law Enforcement Agency and Richland County Sheriff’s Office. Mass Casualty and Disaster Medicine Opportunities. Provide stadium coverage for NCAA Southeastern Conference University of South Carolina athletic events.